Search engine advertising is a form of Internet marketing that seeks to promote websites by increasing their visibility in search engine results pages (SERPs). Besides the advertising, search engine marketing (SEM) can be done also through search engine optimization (SEO). 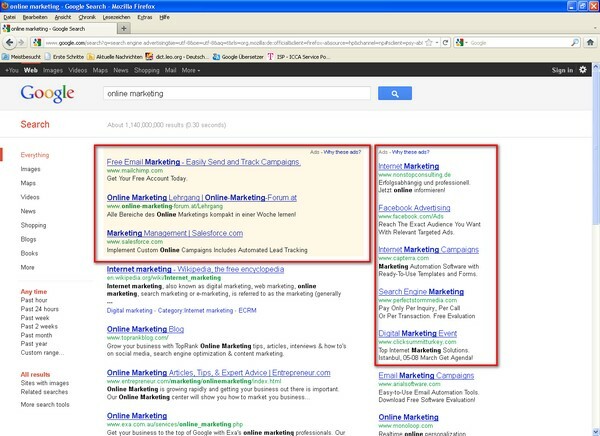 Search engine advertising is employable for both large and small businesses. Paid search engine advertising provides an efficient way for all kind of business to address groups of people most likely to be interested in their products and services. Unlike advertising in traditional media that typically requires the marketer to pay the publisher for messages that may not be seen, search engine advertising is more targeted. It is designed to appeal just at the time when the individual is most receptive and most likely to take advantage of, or convert to, a marketing offer. Search engine advertising is more effective and delivers a higher click-through rate than banner advertising. Pay per click search engine advertising is unlike traditional forms of advertising, marketing and promotion. One of its most important characteristics is it is nonintrusive nature. Unlike advertising that uses time-honoured techniques to distract or interrupt prospective customers from whatever they are doing, it is delivered only to potential customers when they are actually searching on keywords related to products or services contained in the ad. Nobody forces users to click on search ads. Ads on search engine results pages (SERP) are always clicked voluntarily, which means that the person who sees the ad has affirmatively decided to initiate a conversation with the marketer who has paid to run the ad in the search results. Search engine advertising is cost effective in comparison to other types of traditional and online advertising programs. It gives the advertiser full control over the budget and enables him to set systematic budgetary limits to minimize the financial risk and investment. The advertiser pays a rate for each visitor that accesses his website by clicking on a link on the search engine site. The amount per visitor is specified by the advertiser. Every keyword has a “bid” price, depending on the popularity of the keywords in search engines. Results of search engine advertising are clearly measurable. SEA – Information about the German search engine advertising market. SEMPO – Search engine marketing research, articles and resources. Brown, Bruce C.: The Ultimate Guide to Search Engine Marketing: Pay per Click Advertising Secrets Revealed, Florida, 2007, page 33-37. Thurow, Shari: Search Engine Visibility, 2nd edition, Berkeley, 2008. Lee, Kevin with Seda, Catherine: Search Engine Advertising. Buying Your Way to the Top to Increase Sales, 2nd Edition. Berkeley, 2009, page 4-5.